"I live in Alaska and have 3 sons that love to fish. I have had to come up with some pretty creative ways to prepare salmon, this is by far my family and friends favorite way to eat fresh salmon. I soak an untreated cedar plank in water and bourbon while they are out fishing for the day and fix the barbeque sauce so that's it is ready to get grilling....."
Soak the cedar planks in warm water for 1 to 2 hours. Add a splash of bourbon to the water if desired. Bring the pineapple juice, soy sauce, vinegar, lemon juice, olive oil, and honey to a simmer in a saucepan over medium-high heat. Reduce the heat to medium-low, and stir in the sugar, 1 teaspoon black pepper, cayenne pepper, paprika, and garlic powder. Simmer, stirring occasionally, until the sauce has reduced to a syrupy consistency, about 15 minutes. Set the sauce aside. Preheat an outdoor grill for medium heat. Place the planks on the grate. They are ready to cook on when they start to smoke and crackle just a little. Season the salmon with a light sprinkling of salt and pepper. Place the fillets onto the smoking cedar planks, close the lid of the grill, and cook for 10 minutes. Spoon a small amount of the sauce over the salmon fillets, and continue cooking until the fish turns opaque in the center, about 5 minutes more. Serve with the remaining sauce. 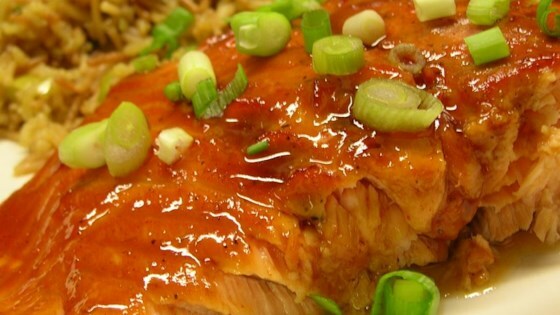 Try this tangy and delicious cedar planked salmon. Thank you for sharing. This was awesome. Instead of grilling; since we are in apartment, I baked the salmon for 25 min at 350 and it turned out wonderful. We thought it was way to peppery and we usually like spicey. We liked the other flavors and might make it again but adjust it a bit. I made this in a skillet (didn't have a plank)and my husband said it was the best salmon he ever had!